This page lists a mixture of ideas and suggestions for KDE 4 goals from the community as well as some details of actual changes based on progress thus far. Please do not assume that anything listed here is a promise for what will be in the KDE 4.0 release. improve type safety by using the C++ keyword "explicit"
Suggestion: try taking a look at e17 could use ideas from there. it's already very advanced compared to what we have these days. and i always use right click on my desktop to access the menu. Suggestion: windows xp is outdated and I don't think many people like the start menu style -> make it innovative + integrate some kind of search into it too.. Right. SUSE 10.x has a nice search facility. I feel the KDE Menu should look like this. It seems to be overcomplicated. There shouldn't be any obligatory elements that could be easily done elsewhere. Just the menu tree and (as traditionly done) log off/shutdown buttons. Suggestion: the current Kmenu is almost there, but it would be nice to have in-menu applications search and some way to expand the menu by replacing the current menu folder with next one. To make the navigation easy we could put it the way it was in NeXTSTEP file manager: every opened folder (submenu) leaves an icon on top of the list, so clicking the icon gives a shortcut to the respective menu level. 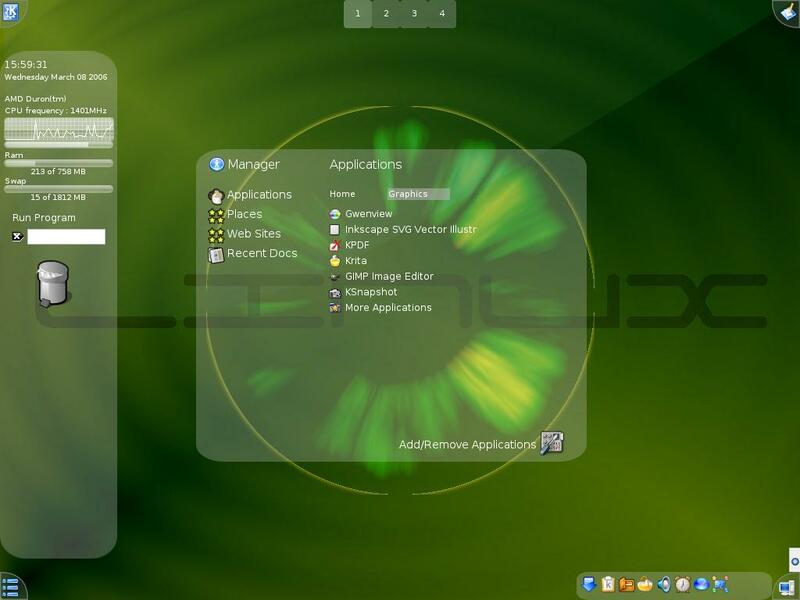 Suggestion: make the KDE-Panel alternatively look like the suse-enterprise desktop panel under gnome. its neat, workflow oriented, integrated with beagle and who doesnt like it should be able to switch to classic view. It seems to be overcomplicated. To pick up an app needed I need an extra click ("all apps"). The start menu should simply be the place where I can choose and run a random app. If I have some final set of favorites apps, I could configure an alternative menu or simple set of launch buttons elsewhere. Suggestion: One thing the KDE users like is the easy configurability of the desktop. Try to make the start menu as adaptable to our taste as you can. We don't need another gnome clone desktop. IMO development of the KDE4 "Start Menu" should start with Kickoff. After using it, the original KMenu, the Windows menus, KBFX and TastyMenu, I'm convinced it's the simplest yet most efficient option I've seen. Suggustion: The start menu is an excuse for complexity, move in a simplicity direction similar to Mac OS X. Suggestion: As the menu is currently a kind of tree, we could project the menu on a sphere - so as soon as you go to the next submenues, the sphere rotates to show the next level(s). Criticism - 3D desktops like Looking Glass, while pretty are often inefficient. Because monitors display in 2D, 2D desktops would seem to be the easier and more productive than their 3D counterparts. There are many promising concepts from both Beryl/compiz and Looking Glass such as the desktop cube. However a fully 3D desktop environment would not be the way to go. Strong criticism - there are many instances of desktops completely unsuitable for such eye-candy, in terms of work productivity and simple hardware limitations (especially laptops, with weak 3D acceleration and small screens, or even high-end laptops with CPU throttled down while on battery power), so the main goal should be an ergonomic 2D interface. Remember, one doesn't use a desktop enviroment for the sake of using it - it's a tool and interface for other things. Good DE/menu/whatever interface-related is the one you don't event notice during your work. There is place for optional gizmos like a 3D desktop, but they come after the serious, useful stuff. BumpTop is a really great prototype of a 3d desktop, even if KDE4 most probably will not go into 3D space. Probably KDE5? I like the idea of marking icons very much. It's a pain in the a** to mark files with the rubberband tool if you got a pile of files which in no sorting order line up easily for using the rubberband efficiently. I often wished I just could draw a freehand rubberband around the icons to mark - this would be cool to have in KDE. Clicking each icon with Ctrl held down is no alternative, and acrobatic combinations of Shift+Ctrl and multiple rubberbands are errorprone and even less intuitive. I've learned from my supporting issues at work that most office users even don't know about the Ctrl+Click feature. The idea of just drawing a freehand rubberband around icons is simply intuitive. Critisicm: Have you got no other thing to eat up your performance? I think, this concept is very nice, but look at the movie. Does that seem more ordered?! I find the eye-candy of Xmetisse very nice - it gives a nice argument against the Vista "Wow"-effect. The possibility to copy pieces of a window to another location, use the windows even if minimized/rotated etc., is very good. I think it could be a major productivity boost if workgroups share a common desktop - but each has an own look unto this "universe". So I work on my spreadsheet, but if my co-worker asks me something I just scroll around to his window - better than VLC or FreeNX. Strongly oppose. KDE must work on computers whit 256 MB RAM+, so 3D effects must be optional (and there is problem whit non-free drivers if you want 3D). My idea is that you can switch between normal and kickoff/kbfx/gnome like/Non-cascading version. AAA Please evaluate an OpenLDAP Service (with plain or DB backend) for Configuration System, is open, is standard, is free. It's possible to configure all system or a network with ldap. Apple have replaced Netinfo in favour of openldap. new KDE control center design -- standalone control center needed? Centeralized spellchecker, many non-english users expect to change spellchecker from only one part. Thanks to Scribe. Evaluate knoda a full featured and working KDE database frontend with a rich set of command line options and python scripting. make use of Qt's Interview classes in Konqueror's file views. This could clean up and reduce the code and make the views more memory efficient. make the views more consistent with the current task. Leave only relevant menu options, have the ability to change the menu (not just the toolbar) for each view. A backup resource shared between all KDE applications would be nice. Users keep asking about it. For example, they want to backup all their Kontact data. Or some app settings, or backup all settings and so on. 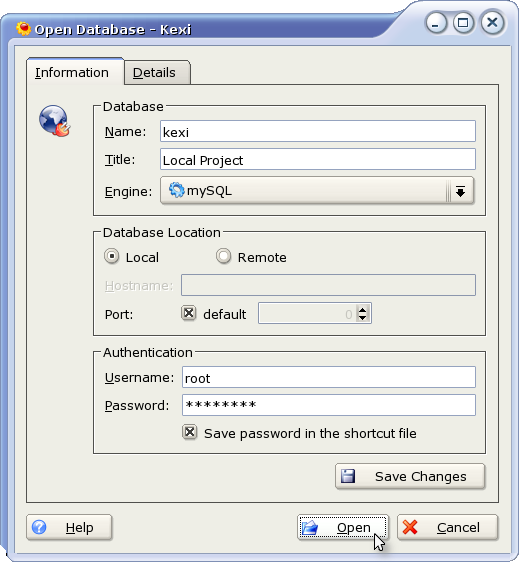 Kamion is an application and library for backing up selected application data. as part of the kde4 experience seems to be about going all sci-fi, i couldn't refrain from linking this article (arstechnica.com) here which draws a detailed picture how a file system like zfs (sun.com) could help any time machine like tool. and boy is it impressive. Doc improvement: kio_help: share help from high-levels dialogs or KParts. I explain: for example kdelibs/KSpell2 config dialog is used by many apps but each app has to rewrite the doc for it. I would like a doc in kspell2 for the config widget and then that doc would be used by all apps using the dialog. Same for shared widgets in module/libs (like KOffice Autocorrection dialog is shared between KWord and KPresenter, i'd like to have 1 doc only for it) - Contact annma for more precisions! Are we using native printing, or are we all going to have to migrate to CUPS? Nepomuk-KDE as alternative, system wide, data-backend for KDE Applications. This can act as global store for applications including PIM, desktop indexing (including MP3/OGG file information), and ATOM/RSS reader storage. This page was last modified on 9 March 2016, at 19:39. Content is available under Creative Commons License SA 4.0 unless otherwise noted.